We are a jolly and inclusive group and love meeting new people so you will be made very welcome. If you have ever wanted to try a day’s hunting, here are a few pointers to get you started. Although hunting legislation in England and Scotland* is now in force, like all hunts, the CVNNH continues to hunt within the restrictions of these laws. You do not need to be a member of the Hunt to get started as you can buy a day’s membership or ‘cap’ as you go along. With the CVNNH your first day is FREE! After that you will be asked to pay the daily cap rate appropriate to your age (see Subscriptions). Although most people who hunt follow a dress code please do not let that put you off! We are a friendly bunch and love to see new people giving hunting a go. So as long as you wear appropriate safety clothing (e.g. correctly fitting hat and boots) and your horse is clean, then any jacket or coat is fine for when you are starting out. It is much more important that you are warm and dry! You can hire an experienced horse (see Hirelings) or you are welcome to bring your own. You should feel confident that you can control your horse in open spaces and that he/she will not kick. Your horse should be fit because hunting, particularly in the hills, is demanding on a horse. If your horse has never hunted before then Autumn hunting (September – October) provides a gentler introduction. If you are concerned, you can simply come out for a few hours and then take your horse home. Jumping is not compulsory! In fact we have a number of meets, particularly in the hill country, where there will actually be no fences to jump at all. Where there are hunt jumps or obstacles these will be approx. 3 feet high and are usually open and inviting. If you would rather not jump, there is always a way round and plenty of others who will not be jumping either. Do make sure that your horse’s tack is in good condition. We don’t want any accidents on the day! We have a specific Newcomers Day in October where you will meet others who are trying hunting for the first time. Check the website or Facebook for details. Please be aware that, while other mounted followers will do their best to help you, there is an inherent risk to any horsey activity and you are responsible for your own safety and you take part at your own risk. We welcome members of any Pony Club to have any number of days with us. After your first day you will be expected to pay a modest cap and should look at our Subscriptions page or speak to the Hunt Secretary about this. If you are over the age of 16 and have good control of your pony / horse we are happy to see you and will do everything we can to make you welcome. Younger riders, or those who are nervous, should be accompanied by an experienced adult. The CVNNH has a large country over which it hunts. Some meets are in low country with grass, arable, woodland and jumps. Others are in the hill country which can be more challenging for newcomers who are not used to that sort of terrain. To find out what sort of day would suit you best, talk to the Hunt Secretary who will advise you. Don’t be! If you don’t understand what’s going on just ask. We are a friendly bunch from all walks of life who love what we do and want others to share our enjoyment. No one will judge you if your horse is hairy or you don’t have all the gear. 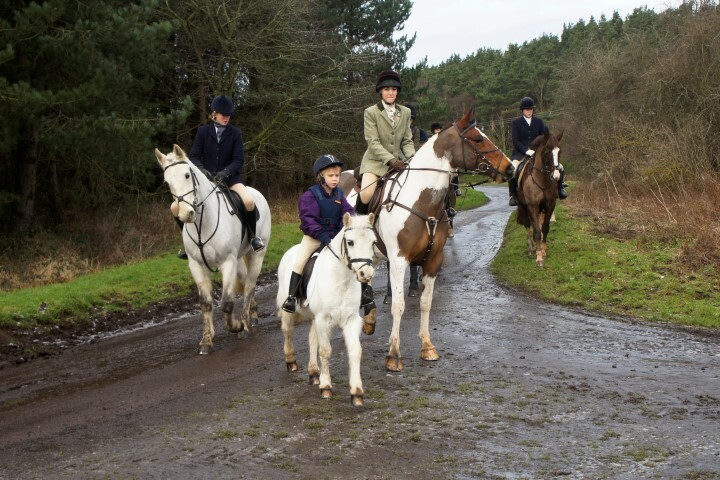 To find out more about what a day’s hunting involves, see the Horse and Rider page.